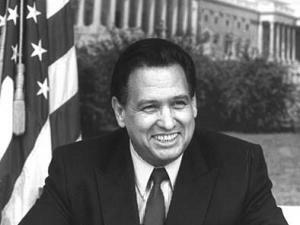 Matthew (Marty) Gilbert Martinez was a California Democratic congressman. H.R. 950, the Job Creation and Infrastructure Restoration Act of 1997 was introduced in the 105th Congress on March 5, 1997 by Congressman Matthew Martinez of California. It had 33 original co-sponsors, including Nydia Velasquez. The primary purpose of this emergency federal jobs legislation was to provide much needed jobs at union wages to crisis ridden cities by putting the unemployed to work rebuilding our nation's infrastructure (schools, housing, hospitals, libraries, public transportation, highways, parks, environmental improvements, etc. $250 billion is authorized for emergency public works jobs over a five year period. New York affiliate, New York Coalition for Public Works Jobs, c/o Utility Workers Union of America Local 1-2. The April 9 1994 Los Angeles state wide convention of the Mexican American Political Association, unanimously approved a public works jobs resolution. Jose Chacon, MAPA's metro region organizer told the People's World "Mexican-Americans have every reason to go all out, hand-in-hand with labor to support this bill. its a matter of survival"
Addressing MAPA's convention banquet Rep. Matthew Martinez said that he was looking at the Works Progress Administration legislation passed in 1935 as a guide for the public works bill - popularly known as the Martinez Jobs Bill. This page was last modified on 15 September 2011, at 00:10.